Nabile's next chance came the next morning as Nightsteed said, "Ahem... Jazan... you are my superior in terms of magical knowledge, but I don't believe that it's possible for anyone to be in two places at the same time." Jazan gave Nightsteed an even look. "Where am I supposed to be?" "You're supposed to be speaking with Lord Farouli and Lady Zara in an hour. At the same time as you're supposed to be meeting with Kiyaa and storing some power for them to use in the foundation project." Jazan looked up at Nabile – she was perched on her stool next to him, trying to understand the handwriting of one of the stewards. "Nabile, would you be comfortable if I sent you to Farouli and Zara in my place?" Oh. Nabile hadn't talked with Farouli and Zara much. They were a little older, and more than a little intimidating – a tall fire Gelert and an absolutely beautiful royal Ruki. They seemed nice enough, but whenever Nabile had had cause to speak with them they still both made her feel like a small, grubby street thief. She doubted it was on purpose – Zara was so beautiful and elegant that she probably made everyone feel that way. But she'd asked for this. She did want this – she wanted to be able to stand in for Jazan so that she could help him and help the city. Of course, when she'd spoken to Jazan on the wall last night, she hadn't expected it to be this morning. Still, she couldn't say no and still claim to be serious about helping him and learning how to rule well. "I'll do it. What are you speaking with them about?" Jazan said, "The rebuilding, as usual. Farouli's family is in possession of the Five Scarabs – gemstones that have protective powers as well as storing magical energy. They're extremely valuable artifacts, and it's a marvel that Farouli and Zara were able to keep them safe." He didn't add that they'd kept them safe from his father, but Nabile understood. "We have so much to rebuild... the curse completely shattered generations of magical protections in the palace. We have the plans for the city walls to build them anew, but I could use the Five Scarabs to fortify the Palace itself – I could do it without them, but I would need the help of the mages to do so, and they have enough to do. Also, the palace is the king's domain, and I would prefer to have those spells under the king's command." Nabile asked, "So you want Farouli and Zara to give you the Five Scarabs?" Jazan said, "Not give. That would be unfair. I want to compensate them – today I intended to speak with them, explain why I wanted them, and begin to get an idea of what they would consider an appropriate payment. I wasn't going to solidify anything today – I trust you, darling, but if Farouli and Zara wish another protective artifact to replace the Scarabs..."
Nabile nodded. "I wouldn't know what we have or what it does or anything about those, really. So I just need to explain how you want to protect the Palace and say you'd like to buy the Five Scarabs from them?" Nabile looked down at herself, surveying the dress and necklace she'd picked out today. "Do I look queenly enough?" Jazan was very good at knowing how to look regal – he always looked kingly and just a little bit scary, and he loomed ominously as easily as he breathed. But Nabile had gotten to know the man behind the big, scary king, and she knew that he was gentle and generous and kind. He smiled at her. "You look wonderful." She pointed out to him, "Wonderful isn't necessarily queenly." Nightsteed snickered, but then said, "You look fine, Nabile. This isn't a state dinner, it's a quiet meeting. And you'll do well." Nabile said, "I ought to understand more about what you want to do with the Five Scarabs, and why you need those, especially." Jazan took a quill, dipped it in ink, and started writing furiously. "I'll give you some notes – what I want to do with them, why I want those particular artifacts, and why nothing I have around here will work the same way. Mostly, it's because the Five Scarabs are linked to each other – placing them in significant spots will allow for a network of spells to connect more thoroughly. If I use unrelated objects, I'd have to make up the difference with my own strength." Nabile asked, "Are you sure you shouldn't handle this?" He reminded her, "Neither Farouli and Zara are mages – they won't understand how these spells work any more than you do." That wasn't a lot of comfort. But Nabile had said she was going to do this, so she'd just have to figure it out as she went along. She smiled. "If it goes badly, we can ask the Desert Scarabs to swipe the Five Scarabs." Jazan snorted. "I don't think we'll need to resort to that – though I'm certain they'd offer." He added, "In honesty, though, I want you to go out of your way to make sure they know this is entirely of their own free will. I don't want them to believe they are compelled to sell me the Five Scarabs – that would be the action of a tyrant." And Jazan was rebelling against the tyranny he'd grown up with, doing so with every thought and every fiber of his being. Nabile loved seeing that in him. She nodded. "I can do that. I think. I hope." Nightsteed poked her lightly in the arm with his horn. "Remember. You are capable. You are confident. You are queen, and don't let anyone tell you otherwise." Nabile asked a few more questions about how Jazan wanted this ward to work and what made the Scarabs special, just to make sure she'd be able to explain it. But then she gathered herself up, took the sheaf of paper that Jazan offered her, and walked down to the room where Jazan had arranged the meeting with Farouli and Zara. They were already there, waiting for her while talking quietly to each other. 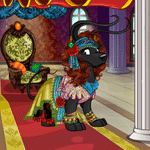 The tall Fire Gelert wore plain, dark clothes, very similar to the ones Jazan typically wore, and the royal Ruki had donned an absolutely gorgeous silk robe. Nabile had to keep herself from curtseying automatically – though they were majestic, and they were also old enough to be her parents, she was their superior. Jazan was young, compared to many of his nobles, but he bowed to no one. She did what he did, and nodded her head. "Good morning, Lord Farouli, Lady Zara." Farouli nodded his head in return. "Good morning, Queen Nabile. Where is the king?" Nabile explained, "There was a conflict – the mages needed him to help with a spell. As I could not stand in for him there, he asked me to represent him to you." Farouli held the door to the meeting room open for Nabile – it was a small one, with a table that would only sit six and no other furnishings, but it did open up to a courtyard with a defunct fountain. Nabile decided she'd talk to Jazan – maybe see if they could get that fountain fixed. She took a seat at one side of the table, and the Gelert and Ruki sat next to each other on the opposite side. Farouli said, "His Majesty informed us that this meeting is about the Five Scarabs. I have brought them here – would you care to see them, Your Majesty?" Nabile was interested. She nodded, and Farouli took off the wide sash he was wearing. He had another belt underneath it – as he laid it out, Nabile realized that the inside of the sash was made up of five little pouches that enabled the wearer to keep the contents close to their body and away from scrutiny. They were five scarabs, as the name indicated – each of them was wrought finely out of gold, about the size of the palm of Nabile's hand. The shell of each was a different gem – the sections were large stones with a deep, pure color that Nabile had learned to recognize marked them as incredibly valuable. She used one finger to lightly touch the brilliant topaz carapace of the scarab closest to her. "They're beautiful." Zara smiled at her. "You have somewhat of an affinity for Scarabs, don't you, Queen Nabile?" She did, and she covered the tattoo on her arm self-consciously as she wondered for a second whether that was a slight – probably not worth worrying about, though. If she tried to second-guess everything these two said to her, they'd never get anything done. So she nodded and smiled. She said, "Jazan wanted to talk to you about the Five Scarabs because he knows they're powerful protective artifacts, and he's working on replacing lots of different spells that protect the palace. He thinks they could make the job a lot easier for him, but he wanted me to make sure you know that you're under no obligation to sell them to him – and that if you do sell them, he wants to make sure you're paid fairly. Here – he wrote some notes about the project." Jazan normally did things more slowly, she knew. But Nabile had just laid everything out because she didn't really know how to be more circumspect about it, and besides, it seemed like a waste of everybody's time. Zara and Farouli started reading over the notes. Nabile tried not to twitch as they did so. Finally, Farouli said slowly, "I believe I understand why he wishes to use the Scarabs specifically in this." Zara said, "We had wondered about having them used to create protective spells for our own estate." Nabile asked, "Is there anything else that Jazan could offer you to help you with that?" Zara paused. "Do you believe that the king could ask the Mages' College to create our protective spells?" That made sense. Jazan wanted to be the one who did his own protective spells, so he'd be the one who had access to them. But since Farouli and Zara weren't mages, they had to have other people do those spells anyway. Nabile said, "I'm certain he'll do it – I'll be glad to speak to him for you, make sure it would be to your specifications." That had come from another room on the opposite side of the courtyard outside. At the yell, Nabile reflexively jumped to her feet. "At least I'm not a cowardly rat..."
Zara said, "It seems diplomacy has failed someone." Farouli observed, "Thank you, Grand Lady of Understatement." Nabile asked, "Would you mind if I left for a moment? I ought to go see what's happening." Even if she couldn't actually do anything about it, if it had come to screaming insults Jazan would probably want an eyewitness account. Zara said mildly, "We may follow. At the very least, it may prove diverting to watch adults comport themselves as small children." Nabile sighed. "Here goes, then. Let's see what's gone wrong this time."